No, it’s not the start of a corny joke! Each year, Orcas Artsmith awards Artist Residency Fellowships for artists, scholars, and writers to create new works. The week-long residency takes place each January at Kangaroo House B & B in Eastsound, WA. Up to five fellows are selected, and people apply from all over the U.S. for this opportunity for inspiration on Orcas Island. Imagine what you could write at this desk! This year, four of the fellows, along with Artsmith founder Jill McCabe Johnson, joined me for several hours to write on the Interisland ferry. Artsmith Fellows writing aboard the Tillikum. L – R: Jennifer Bullis, Debra Babcock, Jill McCabe Johnson, Gail Folkins, and Jeremy Hance. They boarded on Orcas around 12:30 pm and were hard at work when the Tillikum stopped at Lopez and I walked aboard, too, for my regular time as Writer-in-Residence. What a boon for me, as I had such accomplished companions during my two-and-a-half hour writing stint that day. Here’s a bit about them, as well as a peek into what they’re working on. Debra Babcock has been weaving fine and performing arts with healing arts for over forty years. Her blog, Dune Shack Dharma – Making Art Out of Everyday Life and Getting Healthy in the Process, is a prime example. The founder/director of Harmony Network Chiropractic and Yoga, and founder of the Heron Way Writing Group, Debra’s editorial articles featured regularly in “Cape Healing Arts” magazine. A long-time visitor to Orcas Island, Debra and her husband now call it home. That recent move, along with Debra’s many years living on Cape Cod, are major themes in her memoir-in-progress. Jeremy Leon Hance is a freelance environmental journalist who writes for The Guardian’s “Radical Conservation” blog. His Life is Good: Conservation in an Age of Mass Extinction, is a short collection of environmental essays. Hance lives in Minnesota with his wife and daughter, and when he arrived for the residency, he learned his grandparents met in Anacortes! He travels a lot for work, and the travel memoir he’s working on will include “stories that happen on the way” as he copes with anxiety and depression. “I hope it will be funny and poignant.” And likely familiar to those of us who also struggle with travel stress. Michelle Goodman, an independent journalist, storyteller, and creative nonfiction writer, also was a fellow but was unable to join us on the ferry. Her writing has appeared in the Washington Post and the New York Times among many other news outlets, as well as in several book anthologies. The author of two career guides for artists and creative workers: The Anti 9-to-5 Guide and My So-Called Freelance Life, Michelle is also co-curator of Working Stiffs, a Seattle reading series about work. Jill was able to get away from her busy desk to join all of us, too. Her latest book, the poetry collection Revolutions We’d Hoped We’d Outgrown, is shortlisted for the Clara Johnson Award in Women’s Literature from Jane’s Stories Press Foundation. Jill’s Diary of the One Swelling Sea won a Silver Award in Poetry from Nautilus Book Awards. She also blogs at Chanson d’Aventure. Artsmith, which Jill founded, is a non-profit organization promoting arts education and the creation of new works of art through residencies like this one, workshops and retreats, literary events, and exhibition and performance opportunities. Along with me, Jill also serves on the board of the Orcas Island Lit Fest. I don’t know how Jill makes time to write, but as we wrote and rode today, she was “tinkering with an essay collection about maps and wayfinding. But it’s a big, tumultuous mess right now,” she says. Look at these hard-working writers! Jill likely doesn’t know what a comfort her words were to me that afternoon as I tinkered away on my own essay collection about the Salish Sea and climate change. Surrounded by all of these writers, some with furrowed brows while tapping keyboards and scribbling in notebooks, I was heartened to keep at it. This entry was posted in Artsmith, writer-in-residence. Tagged Artsmith Fellows, Essays, interisland ferry, Jill McCabe Johnson, memoir, novels, Orcas Artsmith, Orcas Island, Orcas Island Lit Fest, poems, Salish Sea, Tillikum, Washington State Ferries, writer-in-residence, writing. Previous Post Previous post: What’s the Plan? 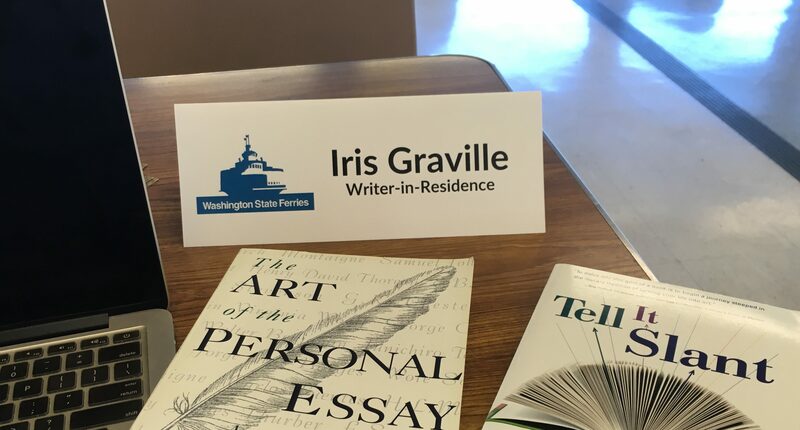 Iris, it was delightful to see you and write with you on board the Tillikum. All the best with the rest of your residency with Washington State Ferries! Thanks, Jennifer. Great to see you, too. You all inspired me! Best to you with your projects; eager to read that essay you didn’t expect to write! I am so glad you are doing this! Sounds like a great day. Maybe you could put out an invitation to writing groups in Seattle/the islands and get more groups to join you? Thanks, Nancy. Great idea about getting the word out to writing groups. First, I need to get my OWN writing group to join me! Love this. Thank you for sharing. Hope to catch you during one of your writing sessions on the ferry one day! Thanks, Ayn. Afraid I don’t have a regular schedule on the interisland, but it would be super if we were both riding some day. And we could write together, too!